The Labour Party’s proposals for reinvigorating the economy provide a much needed boost. 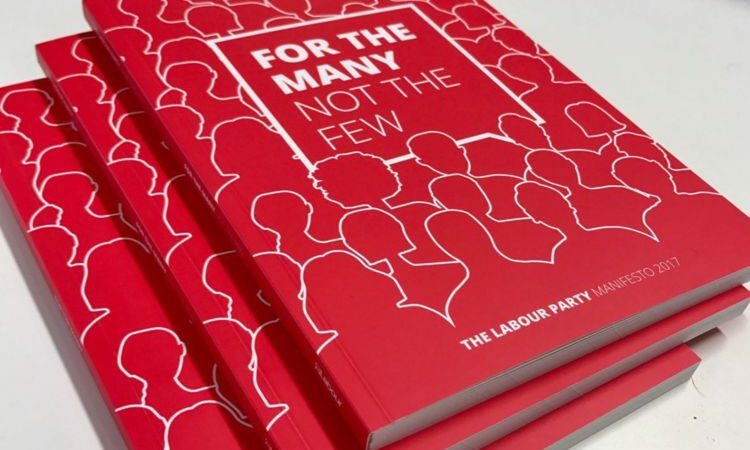 The manifesto launched today redistributes, invests and provides help for the disadvantaged, thus creating the conditions for economic growth. The current economic scenario is not encouraging, Inflation is rising and inequalities are widening. Brexit uncertainties have persuaded many companies to check investment in the UK. A necessary condition for building a successful economy is that people must have sufficient purchasing power as without that they cannot buy goods and services. However, due to wage freezes, low national minimum wage, never-ending austerity programmes and zero-hours contracts, people’s purchasing power has been severely eroded. Between 2007 and 2015, the real wages of UK employees fell by over 10 per cent, almost the largest fall among major industrialised nations. At the end of 2016 the share of GDP going to employees in the form of wages and salaries shrank to around 49.5 per cent (see Table D of the UK Quarterly National Accounts) compared to 65.1 per cent in 1975. The Bank of England has forecast further fall in wages and living standards. In a comparatively rich country, 40 per cent of the working-age population has less than £100 in savings. Millions rely on food banks to secure their next meal. The poor also become victims of the payday loan industry and end up paying exorbitant interest rates. Personal debt now stands at record £1.529 trillion and ordinary person’s ability to stimulate economic demand and investment is severely eroded. A change is desperately needed, but successive governments have been hobbled by ideological dogma and belief in the trickle-down economy. All that has happened is that wealth has percolated up, leaving a few crumbs for many. Historically, the UK economy has been built jointly by the private and the public sector. However in recent years, for ideological reasons, public investment has been sidelined. Now the Labour Party is making a decisive break. Redistribution of income/wealth, decent wages and state intervention in the economy are no longer the dirty expressions. Indeed, they were the key to rebuilding after the 1929 crash in the US and elsewhere and are as relevant today. This Labour manifesto promises an annual stimulus of £48.6 billion, that is the current expenditure. The investment is in education, the NHS, social care, the police, firefighters and border guards. Labour has promised to abolish all tuition fees and relieve the debt burden on many young people. The real value of state pensions will also be protected. The manifesto restores Housing Benefit for under 21s and abolishes bedroom tax and employment tribunal fees. It lifts the one per cent cap on the wages of public sector workers. The expenditure is matched by revenues of £48.6 billion. There will be no rise in VAT. There will be no income tax or National Insurance contribution rises for 95 per cent of workers. Labour will gradually reverse the recent corporation tax cuts and this will raise £19.4 billion. Additionally, £6.4 billion will come from increases in income tax for the top five per cent of taxpayers. This will be achieved by lowering the threshold for the 45p additional rate to £80,000 of income and reintroducing the 50p rate on earnings above £123,000. An additional £.13 billion will be raised from a levy on companies (not individuals) paying out megabucks to few. There will be a 2.5 per cent levy on earnings above £330,000 and five per cent on those above £500,000. A Robin Hood tax on speculative transactions will raise £5.6 billion and another £6.5 billion will be raised from various measures to eliminate tax avoidance opportunities. VAT on private school fees will raise £1.6 billion. A novel feature of the manifesto is unprecedented transparency. Each pledge of expenditure and revenue-raising is carefully costed and shown line by line in the manifesto. Each line is then supported by further background papers. In addition to the above, Labour has a programme of investment in social infrastructure and nationalisation of key industries, such as railways, gas, water, electricity and Royal Mail. This will be over a period of time. Contrary to the propaganda, some of this has little cost. For example, railway franchises will expire and can be taken over by the next Labour administration. Currently, despite poor service, rail companies receive subsidies of six billion per year (including Crossrail) and these have roughly trebled in real terms over the last twenty years. Most of it vanishes in dividends and high executive pay. So nationalisation can save large part of the subsidy. For others Labour will gradually need to borrow. Interest rates are rock-bottom and negative in real terms. Pundits are already pouring over the details and Institute for Fiscal studies (IFS) has claimed that increases in corporation tax will hit wages and investment. This is nonsensical. The decrease in corporation tax was not accompanied by any increase in wages. So why will the reverse happen? Despite higher corporate taxes in many European countries, workers enjoy higher wages, and their spending power stimulates the economy. UK companies are sitting on a surplus cash mountain of £500 billion and are looking for investment opportunities. That can’t easily happen unless people have sufficient purchasing power and Labour addresses that. “Companies’ main worry now is whether investments they make in Britain will produce a profit at all, not the rate of tax they would pay on them. A corporate tax cut would do little to attract investment until the UK is in a position to resolve the acute uncertainty over its future trading relations with the EU. It would, however, probably lead to lower tax revenues”. sternness or severity of manner or attitude. difficult economic conditions created by government measures to reduce public expenditure. So NO reduction in spending. Mr Sikka’s article is at best disengenuous. The economic approach is “Investment-Led Growth” which is growing the economy by investing in Infrastructure, housing, education, skills and training. We have now had 40 years of Neoliberal Capitalism, particularly in the USA and UK which are the two most unequal countries in the world. Economic Growth is stagnating in both because of underinvestment and a short-term approach to economics. In the UK we grew at twice the rate between 1945-1979 than we have since 1979, so Neoliberalism has failed quite significantly over the past 40 years and a new approach has been proposed. If Neoliberal Capitalism was very Right-Wing “Investment-Led Growth” is a very centrist economic policy building on the mixed public/private economic model that existed before 1979. “particularly in the USA and UK which are the two most unequal countries in the world. Err where did you dig that up from? The back of the sofa where it was lying with your prejudices..? Making claims which are easily verifiable – and which are patently and obviously incorrect – demolishes your case. 1. Where’s the necessary bonfire of tax reliefs for the better off? 2. Where is the recognition that perpetual growth is not sustainable in a single planet? Maybe in small print? You should get out more and travel through Africa and Asia to see real inequality. @Madasafish No reduction in spending, really? Public services have faced massive cuts. Despite your pointless and pedantic dictionary definition what the government since 2010 is recognised as economic austerity and it never produces growth. http://www.bbc.co.uk/news/uk-politics-34790102 neatly summarises all the cuts in spending. @Dave Roberts and Madasafish, I think Martyn Wood-Bevan meant in the developed world, which is true: http://www.independent.co.uk/news/world/these-are-the-ten-most-unequal-developed-countries-in-the-world-10267862.html based on OECD data. Madasafish. Your source is not official government spending figures – .co.uk gives it away – try ONS. Working with the figures are they cash figures or are they adjusted for inflation. The latter gives an idea of any real terms increase or not. You are dishonest for not making that clear – the increase is just over sixteen percent – easily gobbled up by inflation. Expenditure has increased for various reasons – for example the greater number of pensioners, housing benefit, defence, subsidies of first time buyers etc. On the other hand the poor and disabled have been subject to draconian cuts and others like NHS and local government the cuts are substantial. If you are trying to be a spoiler you are incompetent at it! Pathetic responses.. The figures agree with official Government ones and are actual spending..
No wonder Labour have zero economic credibility..